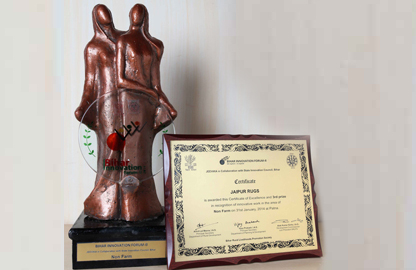 Jaipur Rugs wins the Bihar Innovation Forum Award in Non-Farming Category. Bihar Innovation Forum is an initiative by the Government of Bihar to provide a platform to identify, celebrate and scale up rural livelihood innovations. The program is supported by the World Bank and implemented by the Bihar Rural Livelihoods Promotion Society (JEEViKA) in collaboration with the State Innovation Council. The World Bank will provide capital support and mentorship through its networks and JEEViKA will give access to over one million households organized into Self Help Groups (SHGs). This investment will not be given as a one-time payment but as an investment spread over the time it takes to implement, replicate and scale up winning projects.